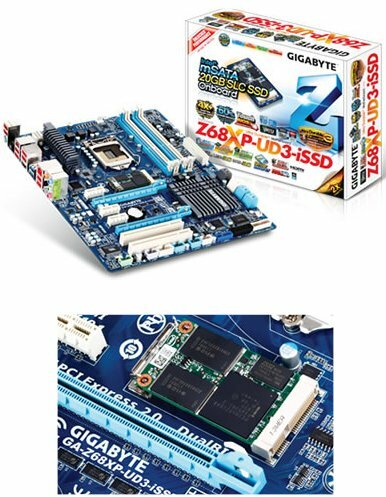 Gigabyte announced the Z68XP-UD3-iSSD, an upcoming Z68-based motherboard with an integrated Intel SSD 311 series 20GB SSD. "We are thrilled to deliver the world's first motherboard to come pre-bundled with an Intel SSD 311," commented Richard Chen, VP of Worldwide Sales and Marketing at GIGABYTE. "Our customers realize the performance benefits that Intel Smart Response Technology has to offer, and the Z68XP-UD3-iSSD is the easiest way for them to instantly take advantage of the performance boost." "By offering the Intel SSD 311 Series, optimized for Intel Smart Response Technology, with GIGABYTE's Z68XP-UD3-iSSD MOTHERBOARD, we can bring the benefits of increased system responsiveness to more users," said Pete Hazen, director of marketing for Intel's Non-Volatile Memory Solutions Group. "A bundle such as this offers users an easy, plug-and-play entry into the quicker response environment of caching with an SSD."